Order a real, traditional Neapolitan pizza from a wood-fired oven. Every pizza you order here is handmade at the time you order. The ingredients for your pizza are largely from Italy; more authentic than this is almost impossible! You can take away your pizza at home, but the atmospherically decorated restaurant, very Italian though, is also a cozy place to enjoy this Italian specialty. Pizza was magnificent and the staff were charming! Couldn't ask for more. Food was amazing! Had the small antipasto, and 2 pizzas, with a lovely bottle of the primitivo. However, one waitress who I assume was the manager? Was awful. So miserable, and when she wasnt telling other people what to do, she was sat at the bar on her phone.. not good! It's a good job that the pizza is so good! Really nice and cozy place to spend good time with family or friends. The service was fast and kind. The Salame pizza was amazing!! Food is great, but we didn't get a discount that was promoted during the booking and service was a bit rude overall. Excellent pizza and lovely service. Definitely worth a visit. We had a wonderful evening. The pizza was very good, the service also. 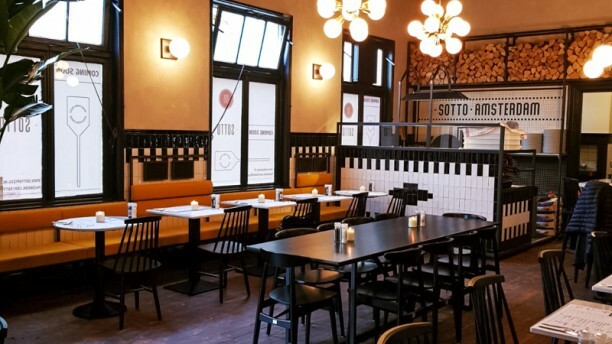 We will visit sotto again. It was great. This time we tried Romana and Verdure. Eacht time the quality is excellent. Best Pizza in Amsterdam (please don’t be too greedy with mozzarella next time). The food was excellent. Service was slow. Fairly good pizza place but dough was somewhat too doughy and lacked taste due to lack of some salt. Toppings are tasty and high quality! Location en decor are unique and nice, mind the beautiful and high ceiling. Staff was friendly but lacked routine and ease, probably because place has just opened. Would surely visit again sometime.